* The government claims that it will trial a ‘system of warning’ before a sanction is imposed. However the Committee (and Oakley in July 2014) called for a first ‘failure’ to lead to a warning letter, and only a second or subsequent failure to result in a sanction. What the government is proposing is different. It is simply a delay of 14 days in imposing a sanction, during which the claimant will be able to make representations. * The government has admitted at https://www.gov.uk/government/statistics/jsa-sanctions-impact-of-not-sending-written-notifications-to-claimants-jan-2014-to-dec-2014 that 47,239 JSA claimants (6.9%) who were sanctioned in 2014 did not receive notification before the money failed to appear in their account. Applying this percentage to the whole period of the Coalition government, there will have been about 279,000 cases where claimants had their benefit stopped before being notified. This issue was highlighted by Oakley in July 2014. The government now proposes to deal with this by reintroducing computer-generated notification, but admits that this will be unlikely to be 100% successful. * The current provision that sanctioned claimants, other than arbitrarily-defined ‘vulnerable’, cannot apply for hardship payments for the first two weeks of a sanction is responsible for destitution and food bank use on a large scale. The Committee firmly recommended that all sanctioned claimants should be able to apply from day one. The government has now agreed only to consider extending the definition of ‘vulnerability’ for the purposes of day one application to ‘a wider group of claimants’. Duncan Smith’s parliamentary statement, but not the response itself, specifically mentions people with mental health conditions and the homeless. The government says it has also speeded up the hardship claim process so that awards are paid within 3 days, and that subject to feasibility the decision maker will in future set up an appointment to discuss hardship payments where claimants are ‘vulnerable’ or have children. * The government appears to have given up any attempt to ensure that the one third of all sanctioned claimants whose alleged ‘failure’ is not actively seeking work do not wrongly lose housing benefit as a result. These claimants are ‘disentitled’ as well as ‘sanctioned’ and the response (p.5) accepts that HB may be affected as a result. A recent clarificatory circular to local authorities, HB Bulletin U1-2015 (30 Sep 2015) related only to the two thirds of penalties which are purely ‘sanctions’ and not ‘disentitlements’. In the year to 31 March 2015 there were 587,000 JSA sanctions before challenges and 506,502 after. They have fallen by about 44% from their peaks, the main reason being a fall of 37% in the average number of JSA claimants. There is also a downward trend in JSA sanctions as a percentage of JSA claimants, from peaks of 6.77% per month before challenges and 5.83% after in the year to March 2014, to 5.49% and 4.73% respectively in the year to March 2015, although rates have levelled off in the latest quarter. Sanction rates are still 84% and 70% above those inherited from the previous Labour government. These figures do not include jobseeker sanctions under Universal Credit, which probably reached some 1,700 per month by March 2015. No update is available on the proportion of JSA claimants sanctioned, which was about one quarter in the five years to March 2014. ESA sanctions have also fallen, to 43,300 before challenges and 33,353 after in the year to March 2015. This partly reflects the decline in the ‘Work Related Activity Group’, but as a percentage of claimants, sanctions before challenges have also begun to decline slightly, and after challenges have stabilised. In the year to March 2015 the monthly rate was 0.71% before challenges and 0.55% after. New data show that sanctioned ESA claimants are almost as likely to be sanctioned repeatedly as are sanctioned JSA claimants. Under the new regime since 2012, the former received an average of 1.69 sanctions each after challenges, and the latter 1.81. A clarification by DWP has revealed that while all ‘reserved’ decisions that become actual sanctions are recorded as adverse decisions, the published statistics are giving us no idea at all of the actual numbers of reserved decisions or of the proportion which end up becoming actual sanctions. Halving of the proportion of ‘reserved’ within total decisions under the Coalition may reflect stricter enforcement when people make renewed claims. Under the ‘Mandatory Reconsideration’ regime, the proportion of JSA sanctions overturned after challenge remains at about 13%, but for those claimants who actually make a challenge it has risen to two-thirds. For ESA claimants, the proportion of sanctions overturned after challenge has fallen from about 35% to under 20%, and for those who actually make a challenge it has fallen from 60% to 40%. As a result of complaints by Jonathan Portes of NIESR and myself, the UK Statistics Authority on 5 August recommended changes in the content and presentation of the sanctions statistics. At the end of this briefing there are notes on this and other recent developments in relation to sanctions, and comments on reports from the OECD and Resolution Foundation. An Appendix reproduces a statement given by a recent claimant to her Jobcentre when she gave up claiming JSA despite still being unemployed. It illustrates many defects of the current JSA regime. 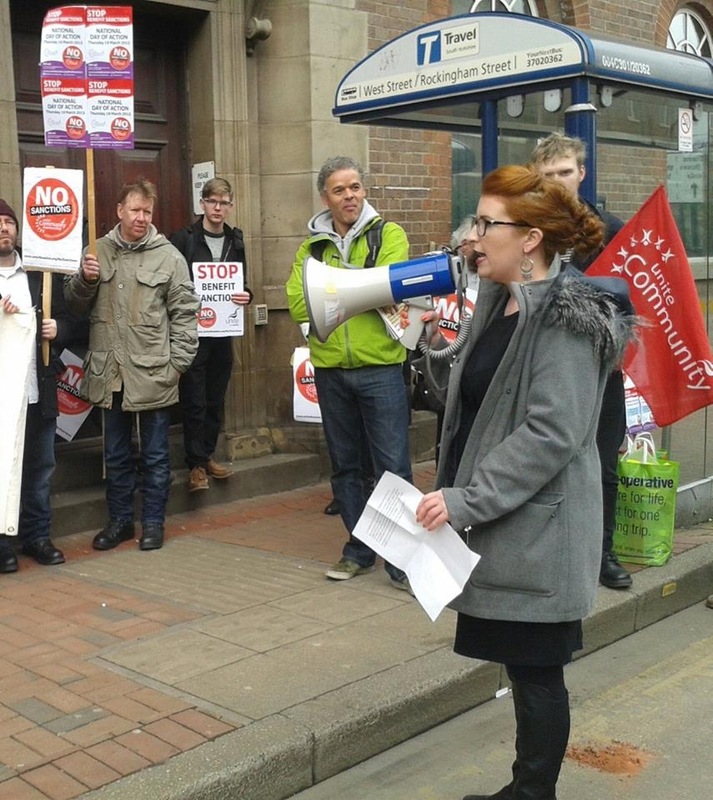 Here is more coverage from the anti-sanctions day of action. 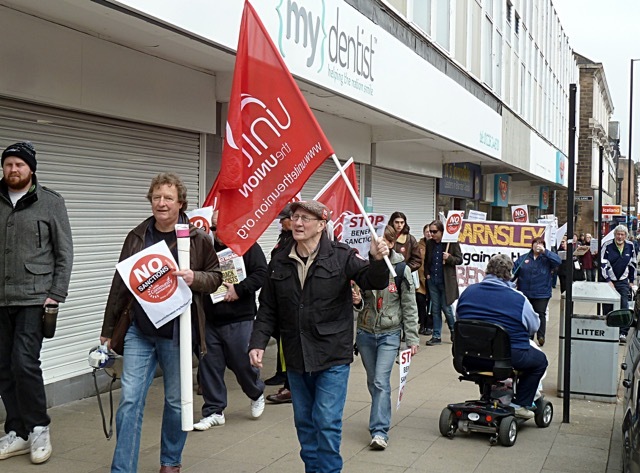 Britain’s biggest union, Unite, will hold protests across the North East of England during a national day of action (Thursday 19 March) opposing benefit sanctions which are now being used on an industrial scale. Punitive sanctions have resulted in over two million people having their welfare payments cut or stopped without warning over the past two years, leading to increased poverty, misery and even death. 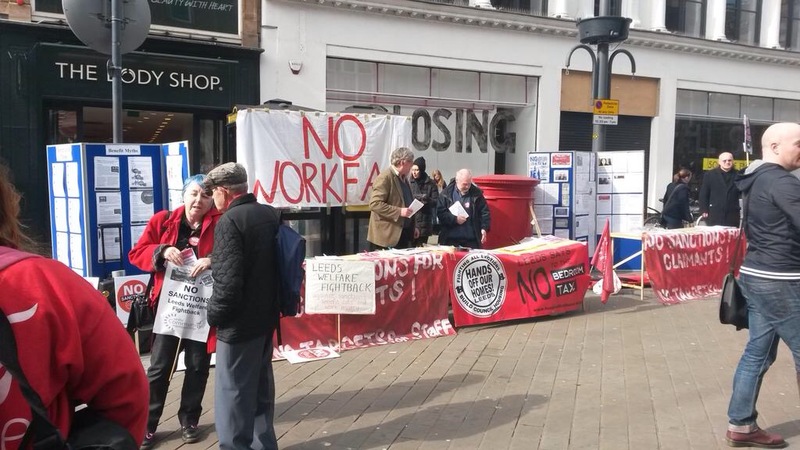 In the North East area the total number of sanctions dealt out by the DWP from October 2012 to September 2013 was 53,883 and 52,420 between October 2013 and September 2014. Gill Thompson, whose brother, David Clapson, died after being sanctioned will be handing in her 211,822-name petition at the DWP – calling on the Prime Minister to investigate the widespread use of benefits sanctions. 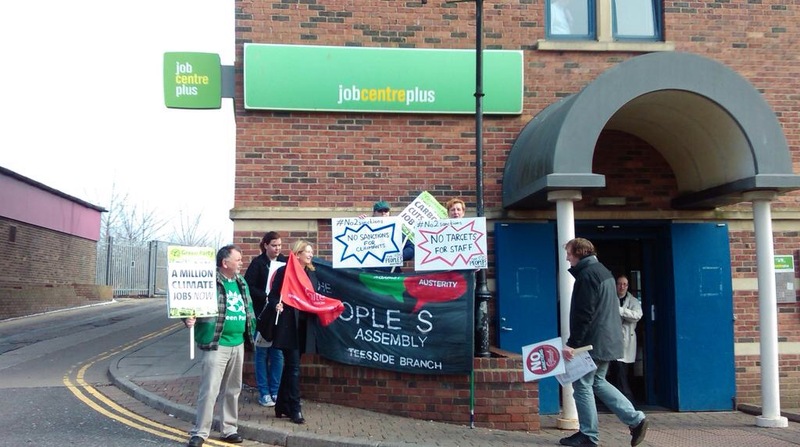 As things stand money can be cut for arriving late at a job centre, missing an appointment to go to a funeral, or even failing to apply for a job – while waiting to start a new job. 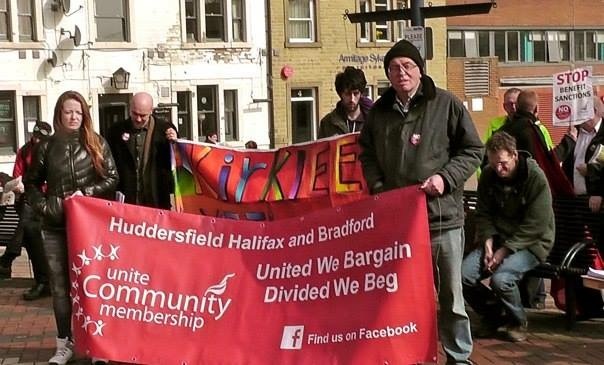 Unite is not prepared to stand idle while this failed coalition government mercilessly targets those already struggling to make ends meet, with ideologically-driven and needless cruelty. “This government is attacking the unemployed for unemployment and treating claimants worse than criminals fined in the courts. Decisions on guilt are made in secret with the claimant not even allowed to be present to explain their case. Britain’s biggest union, Unite, will demonstrate outside the Department for Work and Pensions in London. 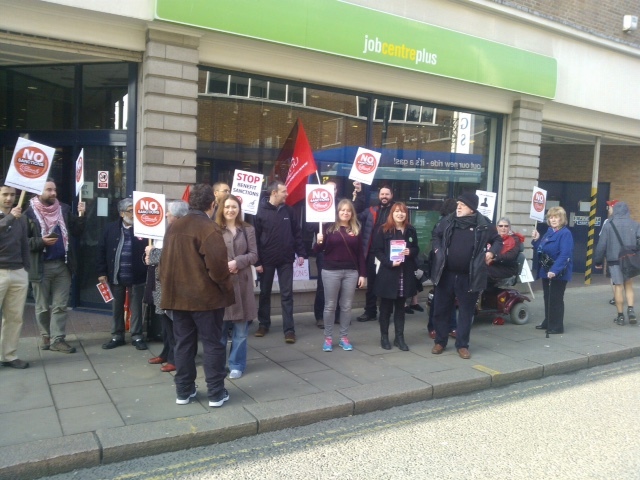 This is part of a national day of action (Thursday 19 March) opposing benefit sanctions which are now being used on an industrial scale.Punitive sanctions have resulted in over two million people having their welfare payments cut or stopped without warning over the past two years, leading to increased poverty, misery and even death. 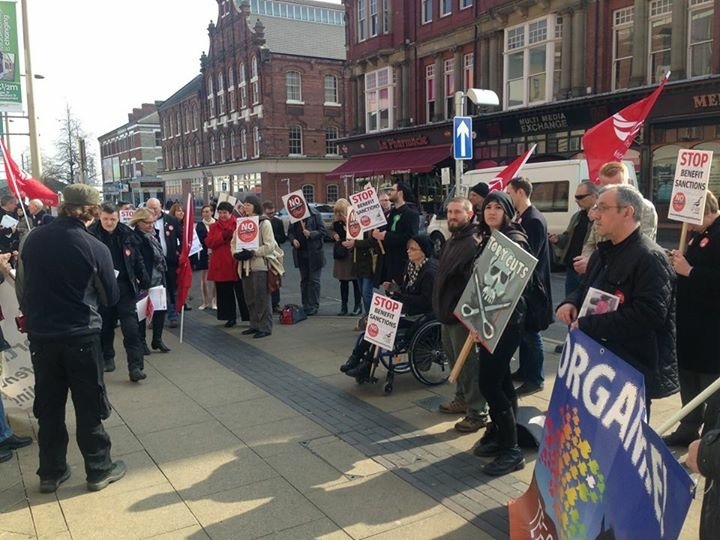 Gill Thompson, whose brother, David Clapson, died after being sanctioned will be handing in her 211,822-name petition at the DWP – calling on the prime minister to investigate the widespread use of benefit sanctions. Unite community members will be taking part in protests across London before moving to the Department of Work and Pensions, Caxton House, Tothill Street, SW1H 9DA for a demonstration from 15:00 to 17:00. Regional protests are also being held up and down the country on Thursday 19 March as part of the national day of action. Benefits claimants are subjected to an ‘amateurish, secret penal system which is more severe than the mainstream judicial system’, writes Dr David Webster of the University of Glasgow. Original article here. Few people know that the number of financial penalties (‘sanctions’) imposed on benefit claimants by the Department of Work and Pensions now exceeds the number of fines imposed by the courts. In Great Britain in 2013, there were 1,046,398 sanctions on Jobseeker’s Allowance claimants, 32,128 on Employment and Support Allowance claimants, and approximately 44,000 on lone parent recipients of Income Support. By contrast, Magistrates’ and Sheriff courts imposed a total of only 849,000 fines. Decisions on guilt are made in secret by officials who have no independent responsibility to act lawfully; since the Social Security Act 1998 they have been mere agents of the Secretary of State. These officials are currently subject to constant management pressure to maximise penalties, and as in any secret system there is a lot of error, misconduct, dishonesty and abuse. The claimant is not present when the decision on guilt is made and is not legally represented. While offenders processed in the court system cannot be punished before a hearing, and if fined are given time to pay, the claimant’s punishment is applied immediately. Unlike a magistrate or sheriff, the official deciding the case does not vary the penalty in the light of its likely impact on them or their family. If the claimant gets a hearing (and even before the new system of ‘Mandatory Reconsideration’ only 3 per cent of sanctioned claimants were doing so), then it is months later, when the damage has been done. ‘Mandatory reconsideration’, introduced in October 2013, denies access to an independent Tribunal until the claimant has been rung up at home twice and forced to discuss their case with a DWP official in the absence of any adviser – a system which is open to abuse and has caused a collapse in cases going to Tribunal. How did we get to this situation? Until the later 1980s, the social security system saw very little use of anything that could be called a sanction. Unemployment benefits were seen as part of an insurance scheme, with insurance-style conditions. Any decision on ‘disqualification’ (as it was called) from unemployment benefit was made by an independent Adjudication Service, with unrestricted right of appeal to an independent Tribunal. The maximum disqualification was 6 weeks, and those disqualified had a right to a reduced rate of Supplementary Benefit assessed on the normal rules. ‘Sanctions’ are almost entirely a development of the last 25 years. The British political class has come to believe that benefit claimants must be punished to make them look for work in ways the state thinks are a good idea. Yet the evidence to justify this does not exist. A handful of academic papers, mostly from overseas regimes with milder sanctions, suggest that sanctions may produce small positive effects on employment. But other research shows that their main effect is to drive people off benefits but not into work, and that where they do raise employment, they push people into low quality, unsustainable jobs. This research, and a torrent of evidence from Britain’s voluntary sector, also shows a wide range of adverse effects. Sanctions undermine physical and mental health, cause hardship for family and friends, damage relationships, create homelessness and drive people to Food Banks and payday lenders, and to crime. They also often make it harder to look for work. Taking these negatives into account, they cannot be justified. Benefit sanctions are an amateurish, secret penal system which is more severe than the mainstream judicial system, but lacks its safeguards. It is time for everyone concerned for the rights of the citizen to demand their abolition. 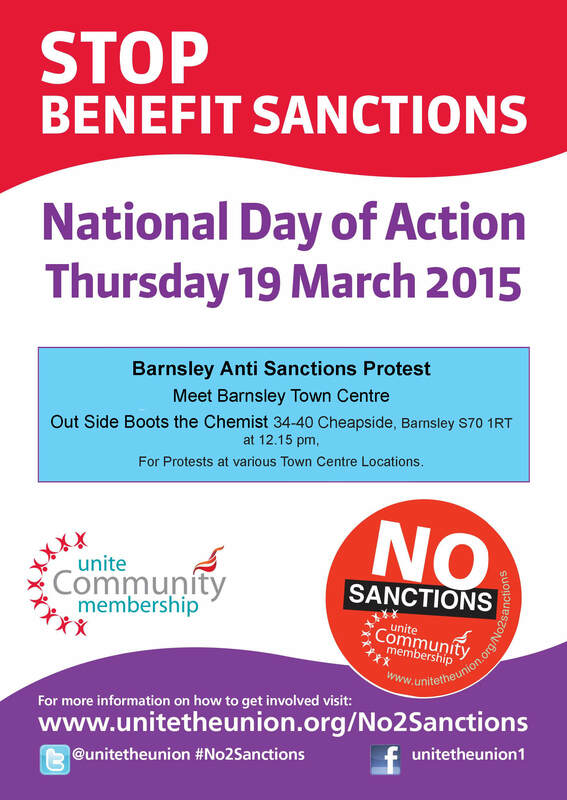 If you are concerned by the effect of sanctions, attend our protest in Barnsley next week. Meet outside Boots the chemists at 12.15 on Thursday 19th March. • The number of JSA sanctions per 100 claimants has almost tripled, from 2.5 sanctions per 100 claimants per month in the year ending March 2001 to seven per 100 claimants per month in the year ending March 2014. The average monthly number of JSA sanctions has risen dramatically from 35,500 a month up to October 2012 to 84,800 after this date. • There has been more than a three-fold increase in ESA sanctions from 1,400 per month in March 2013 to 5,400 in March 2014. The most common reason for a sanction at present is failing to actively seek work, with around one in three sanctions imposed for this reason. Over half of all JSA sanctions are at the lower level, one third at the intermediate level and currently less than 10 per cent at the higher level.